ICN gallery proudly presents “Garden of Russolo” by Yuri Suzuki. The exhibition of a new interactive installation of voice activated sound works “White Noise Machines” is showing at the Victoria and Albert Museum during Digital Design Weekend as part of London Design Festival 2013. Yuri Suzuki is an artist that explores the territory of sound and design by developing devices under the theme of the relationship between music and people. 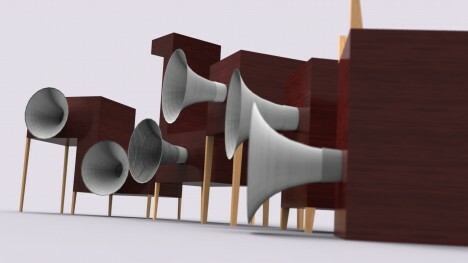 The project this time is to “re-design sound shape” by reconsidering ordinary sound or noise that we are used to hearing. Simple, familiar, and pop design devices (machine) bring “sound”, which is invisible, and “mechanism that moves things” to the viewers as fun experience and lead to surprise and laughter.